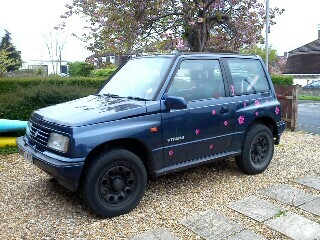 Description of car for sale : Suzuki 1995 N Vitara JLX Manual petrol Blue £550 94,000 miles, "Navy Blue (With Pink Stickers Of Flowers And Fairies That Are Removable) Mot Till Dec Tax Till Sept. Mint Condition Engine, New Clutch, New Brake Disks And Pads, Recently Had Welding. Tyres In Great Condition. Interior In A Used But Good Condition."